With Green Scene Landscaping, you get a single source for complete, luxury landscaping services in Mississauga. From outdoor kitchens to swimming pool installation, interlocking patio design and everything between, you can give your family the upscale outdoor living space they deserve. If you live in Mississauga, Etobicoke or Oakville, avoid the hassle of working with multiple contractors and build a relationship with the team that can service your entire property from start to finish. Our experienced landscaping company in Mississauga is available throughout the landscape design phase, product and material selection, all the way to project completion (and even beyond). You get high quality materials and the skilled hands of experienced trades workers. You get product warranties and workmanship warranties other contractors won’t give. And since we are industry certified, members of Landscape Ontario, and keep our crews informed and educated with industry trends, you can always expect the very best. Starting A Landscaping Project? Download Our FREE Landscaping Project Guide & Checklist! With years of landscaping experience, Green Scene Landscaping is one of the most versatile landscaping companies in the GTA; we offer scaled 2D & 3D landscape designs for all our projects. Interlocking Stone has been the choice of home owners and landscapers for years. With its versatile design capabilities, colours, sizes and patterns, it will continue to be the go-to hardscape material for years to come. Woodwork is an important feature in any landscape design. 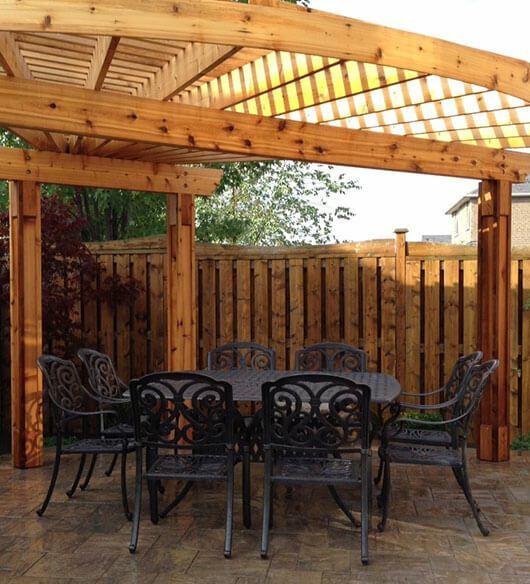 Whether it is a cedar pergola, a composite deck, or IPE privacy screen, wood can add the finishing touches to any project. Green Scene Landscaping has been in business for over 8 years and has transformed hundreds of yards into relaxing spaces across Ontario. Our knowledgeable and trained landscape contractors bring their passions and skill to complete projects in a timely manner. Our landscaping team not only has a wide range of knowledge and experience in the field, they also have construction knowledge that set them apart and above the competition. We have transformed homes and yards across the Greater Toronto Area. See what our past customers have said about our work! Whether you want to enhance your existing landscape, or completely build something from scratch, Green Scene Landscaping can serve your every need. With our emphasis on beauty and reliability, we can help your property achieve and maintain the look and feel of your dreams. Contact us today to speak with an expert and request a quote.